Mundo Trattoria is probably the ‘hottest’ restaurant in the West Island – the place to see and be seen, if you’re into that. The outdoor seating area is limited (fits less than ten) but is quite pleasant to look at, what with an immaculately manicured patch of grass and perfectly trimmed bushes. The windows stretch up to the ceilings – at least twenty feet high, giving the restaurant the illusion of being bigger than it really is (not a bad thing). Two of us ordered the arugula salad ($10) with sweet raisin tomatoes, white balsamic, olive oil and Parmigiano shavings. While the price of the salad is admittedly high – it was worth it. There was something about the way the salad was put together that was incomparable to almost any other salad that I’ve had. Whether it was the freshness of the baby arugula, of the cheese or the quality of the olive oil, I couldn’t quite put my finger on it. So good. The other ordered the soup of the day which was cream of cauliflower, apparently delicious. For the mains, we had the spaghetti al cartoccio which was served steaming in a parchment paper pocket. It was basically a seafood pasta with shrimp, scallops, clams, squid, mussels, roasted garlic, extra virgin olive oil and raisin tomatoes. This is the only dish my parents ever order when we go here, so it’s safe to say it’s one of Mundo’s best. 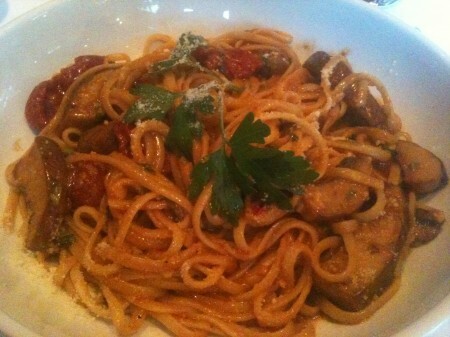 I had the linguine Mundo with eggplants, sun dried tomatoes and mushrooms. Super filling and delicious but a bit too many mushrooms for me. Check it out if you’re out in the West Island and looking for a classy place to eat with your family or for a business dinner. Tags: Arugula, Dinner, Eggplant, Italian, Linguini, Mundo, Mushroom, Salad, Seafood, Spaghetti, St. Charles, Tomato, White Wine.